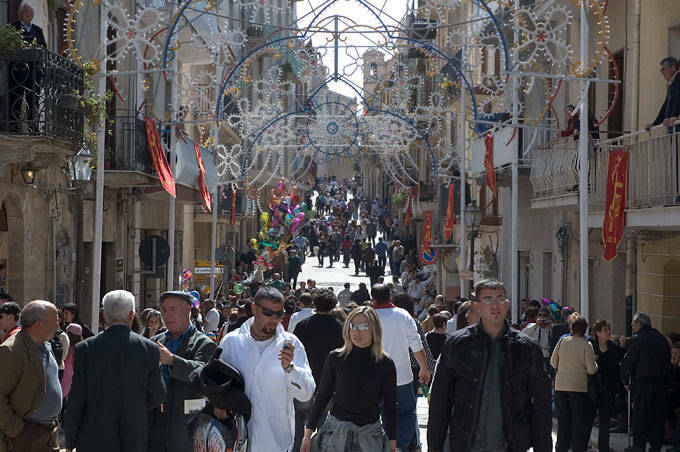 A traveler in the 1800s once described Calatafimi as a hole in the wall, and one must admit that even today it is not among the most welcoming cities in Sicily. For one, it is not particularly prosperous. This may explain why the mafia is not present and it certainly explains why emigration has continued to weaken the town and diminish its population for over nineteen years. Calatafimi’s biggest claim to fame lies in that Garibaldi and his army waged their first battle for the unification of Italy in the town’s streets in 1860. And so begin the captions that accompany Blaise Tobia’s photographs which capture a montage of faces, costumes, and immortal contrasts of a town whose traditions seem to halt the passage of time. The feast of the Holy Cross in Calatafimi is the theme of the photography exhibit on view at the Italian American Museum in Manhattan until March 16. It is a popular feast that mixes sacred themes with local pride and celebrates the miracles that were attributed to the ebony cross from the Church of St. Catherine. The procession transporting the crucifix to the new chapel signals the start of the three-day festivities during the first week of May. The procession also includes a symbolic act of acknowledgement and gratitude to God where the upper classes donate bread, dried fruit, and chick peas which are thrown from parade floats to the poor. This event resembles Mardì Gras in New Orleans in that crowds gather in the streets asking for cheap plastic beads. This event also has strong historical connections; it is said that in 1782 an edict issued by the Bourbon viceroy in Sicily obligated every citizen to give up their arms. The citizens of Calatafimi, traditionally hunters, were wary of the new rulers and had themselves successfully declared military protectors of the church and were exempt from the edict. On the feast day members of the force proudly march in dark suits with shotguns at their sides even as they enter the church. This small town is located in northwestern Sicily where the wondrous Doric temple of Segesta soars above it. Calatafimi has seen its population of 12,000 inhabitants periodically emigrate since the beginning of the last century. Until World War Two a concentration of immigrants from Calatafimi lived on Knickerbocker Avenue in Brooklyn. Today one can visit St. Joseph’s Church on Suydam Street, which has an exact copy of the marble relief of the Madonna donated to this Brooklyn community in thanks for the money that the immigrants sent back home. “What struck me about these people,” continues Blaise Tobia, “is the immense work and attention that they put into preparing for the feast. Over 5,000 people work for weeks as volunteers doing everything from building floats to making decorations and costumes, trying to remain as faithful as possible to tradition. To think that the oxen pulling the carts are a breed that no longer exists in Sicily and are imported from Sardinia to be trained for the procession; tradition dictates that the oxen bow at the foot of the church. I have been to Calatafimi many times and usually the people there do not take pleasure in being photographed, unless you are their cousin! But during this feast, they open up completely.” Tobia’s photographs filter humanity in the same way that temporal mirrors play on the contrast between the old and the new, between a procession in 17th century costumes and a young couple dressed in the latest fashion complete with cell phones, and between a man in a dark cap whose face is marked by time and the red copper hair color of girl from the 21st century. "Castle of Eufemio" (Calatafimi) is on exhibit until March 16 at the Italian American Museum (28 West 44th Street, 17th floor).